A rapid test for the qualitative detection of 3, 4-methylenedioxypyrovalerone (MDPV) in urine. 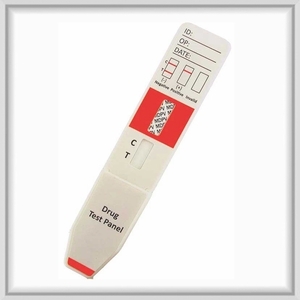 The 1-Panel/Dip Device is the quick and affordable instant drug test. Note:� A procedural control is included in the test.� A colored line appearing in the control region is considered an internal procedural control.� It confirms sufficient specimen volume, adequate membrane wicking and correct procedural technique. The MDPV Rapid Test Panel (Urine) provides only a qualitative, preliminary analytical result.� A secondary analytical method must be used to obtain a confirmed result.� Adulterants, such as bleach and/or alum, in urine specimens may produce erroneous results regardless of the analytical method used.� If adulteration is suspected, the test should be repeated with another urine specimen. The designation of "for forensic use only" means that the substance abuse test is not FDA 510k Cleared. These types of tests are successfully used by law enforcement, correction and probation departments. This product is not intended to be used in the diagnosis, cure, mitigation, treatment, or prevention of disease or illness.